In a perfect world Jim and I would live like many retired full-timers. After observing our 65-and-over neighbors, I believe their days go something like this: Wake up at 8am, grab a cup of coffee and chit chat with neighbors for an hour or two. Then go four-wheeling in the desert until everyone regroups for the usual 4pm happy hour meeting. Jim and I are long way from that life of leisure, so we must work while we travel. 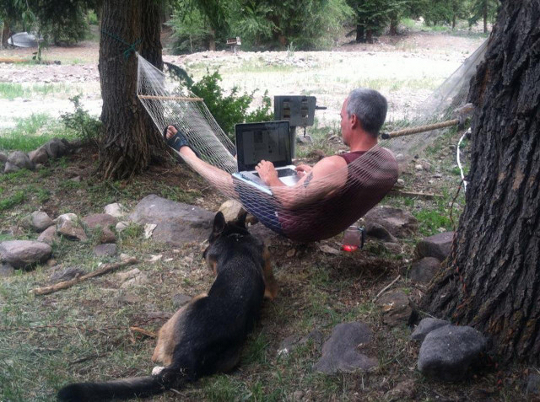 As roving entrepreneurs it’s not easy to keep our noses to the grindstone when the sunny Southwest skies are beckoning. However we know that if we want to keep on rollin, money’s gotta come in. Here are four ways we earn an income on the road. No matter where we live or what kind of work we do, income is never a sure thing in the modern economy. We always keep money coming in from multiple sources at all times. When one dries up, our back-up sources keep things from being uncomfortable until we find a new one to integrate into our mix. Workamping jobs can be great fun! Workamping will not make us rich nor will it pay the bills. But what it does is offset our rent costs. Sometimes we can find a paying workamping job but usually those wages are low. Still, it’s a sweet bonus when we get a little spending money and don’t have to pay rent. Balancing both business projects and workamping is tricky at times, but we think it’s wise to have both in our mix. We weren’t sure what we wanted to do for a living during our first two years on the road. With experience and wanderlust our businesses grew organically out of our two passions: pets and travel. At first we thought we could get away with only an Internet presence. We never listed our snail mail address anywhere, not even on business cards. Unfortunately that didn’t work out so well when customers wanted to reach us through the mail. Or when entities like insurance companies wanted to rate our policies. Like it or not, we had to claim a state to officially call home. We turned to Escapees RV Club to take advantage of the group’s domicile, mail forwarding and support services for RVers. This is the hardest thing to do when all we want to do is to join our neighbors for that daily sunset happy hour at the fire pit. We turn down many opportunities to socialize because it’s a slippery slope to poverty if we don’t put in an honest work day. We try to have as normal a workday as possible most days of the week and we remain grateful that we can work with any office view our heart desires. We also utilize many specific business tools that make a mobile business and lifestyle possible. With too many to discuss here in this week’s column, next Sunday I will get into more details about helpful apps and technology that you can use on a daily basis. Stay tuned!